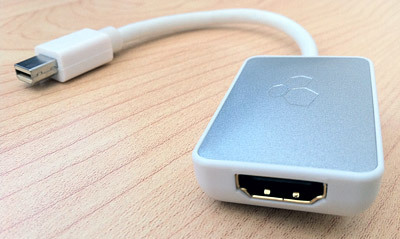 The Kanex iAdapt HDMI V2 lets Mac users connect their Mini DisplayPort equipped computer to an HDTV, HD projector, or AV receiver. Newer Macs support both audio and video output over a single cable. The evolution of Mini DisplayPort to HDMI adapters for Apple’s line of computers has been closely documented on MacYourself. First, Mini DisplayPort didn’t support audio output and adapters were only able to pass video signals to an HDTV. Then manufacturers came up with clunky, yet functional adapters that used multiple connections on the Mac and funneled them into one HDMI cable for transmitting audio and video to the display. The market for these devices was served as best as possible without Apple’s help, and it was kind of a mess. Earlier this year, Apple introduced new MacBooks with a revised version of the Mini DisplayPort connector. Updated iMacs and Mac minis followed soon after. The new connector now supports both audio and video passthrough, making it easier for accessory makers to develop simplified adapters. Kanex, part of Apogee, Inc., recently introduced the iAdapt HDMI V2 to take advantage of the capabilities these new mid-2010 Macs offer. Kanex was nice enough to send us an iAdapt HDMI V2 to test with our 21.5″ iMac (purchased in September 2010). Just looking at the packaging and the device itself, it is a definite improvement over previous versions. It’s small, lightweight, and the silver top helps it fit in with the design of the Mac product line. The best part, of course, is that there’s only one cable required on each side. Just plug the Mini DisplayPort end into your Mac and run an HDMI cable (sold separately) from the other end into an HDTV, HD projector, or AV receiver. This is in comparison to the Kanex iAdapt 51 for 2008 and 2009 Macs, which requires connections on the Mac side for optical audio, USB power, and Mini DisplayPort video. The Kanex iAdapt HDMI V2 supports video resolutions up to 1080p and high quality digital audio. It requires no external power source, so clutter is nonexistent. One note about audio… I did have to go into System Preferences during my testing and select my HDTV from the list at Sound > Output in order for it to work. Other than that, it was simple plug and play. The picture was crisp and clear, so movies rented from iTunes looked great on my television. Of course, using the product for this purpose became less attractive with the new low-cost Apple TV. But connecting your Mac to a TV is still the best way to watch videos from other sources like Hulu. Spending some time with the Kanex iAdapt HDMI V2 makes me wonder why Apple couldn’t have built audio output into Mini DisplayPort from the start. It was somewhat of a hassle to connect a Mac to an HDTV before, but the situation has definitely improved. Kanex maintains a list of fully supported Mac models on its product page, so be sure to take a look at that before buying. I was also told there might be some issues with the 27″ iMac, though I’m not sure how widespread or serious they are. Even if your Mac isn’t new enough to support audio output, the iAdapt HDMI V2 will still enable it to pass video to an HD display. The Kanex iAdapt HDMI V2 is available at a list price of $29.95 from Kanex’s website and online retailers like Amazon.com . It’s definitely recommended for owners of a mid-2010 or newer Mac. Interesting! I’m gonna have to check this out for my new Macbook Pro and 46″ tv. Its cheap enough for me to have it around in case I want to watch something online on a big screen. How do i find out if my macbook-pro 13″ comes with the revised version of the Mini DisplayPort connector? This device listed will only change the video output from the MiniDisplay Port into 1080p HDMI video, as the port doesn’t output ANY audio. So in case anyone is wondering they have to purchase Kanex’s iAdapt 51 model that I recently purchased for video AND sound. It has a MiniDisplay Port, USB, and headphone jack input to give you and output of 1080p high-def video and the ability to play sound, compressed or non-compressed (including 5.1 Dolby Digital Surround). It was almost 60 dollars after tax but I found it on Amazon for 45 and free shipping. Works great and is perfect for watching videos that I have on my laptop on my high-def TV without having to burn it on a Blu-ray disk, provided that I don’t have a Blu-ray burner. You are incorrect. Apple’s latest Macs have a newer version of the Mini Displayport connector that supports both audio and video. The product in this review will transmit sound and picture over a single cable. If you have an older Mac, the product you purchased with the USB port and audio cable is required to transmit audio. But new Macs can use this product instead.